Lonestar's Michael Britt oughta be happy with a rig like this! Besides the fine assortment of Amp-age , the guitar pictured is a Tom Anderson Cobra with P-90's. Talk about a tone arsenal! 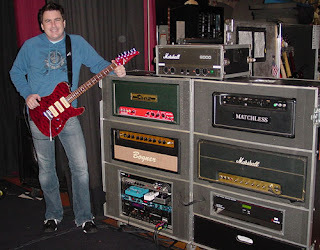 Bogner features tons of their amp models in audio samples from various endorsing players like Britt. Click the image for Bogner's ear candy directory page. 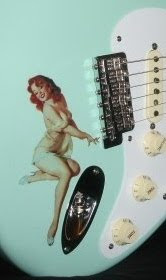 Electric-Guitar-Review also features a German music dealer website with audio sample clips of several top gourmet amp brands.